She started to sail in April from 1939, in New York, with the shipyard Henry B. Nevins. Her owner, Harold S. Vanderbilt, wanted the yacht to compete in racings organized in Great Britain for 12 meters boats. The architect Olin Stephens carried out a very advanced design for that time and he even said it was the finest yacht that had never been done. Without exceeding the allowed weight limits, the Vim’s hard aluminum mast was stronger and more rigid than the one from other similar boats. Her advanced technical characteristics were completed with a special device at the helm, which allowed controlling the yacht from the cab. With her success in the UK, broke all records. She won 19 of the 28 races in which she participated during this period, becoming a legend in the Marine competition. 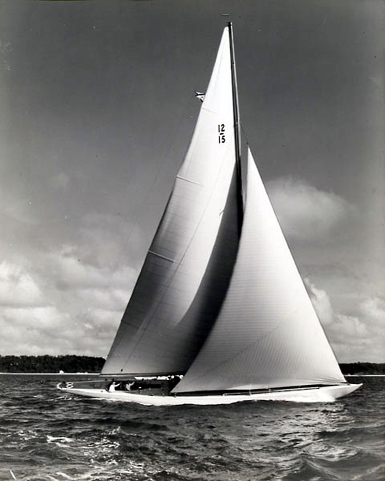 From 1951 to 1964, the Vim kept triumphing in the America’s Cup competitions, and she even appeared in the cover star of the prestigious magazine Life. However, the architect was forced to modify some aspects of the yacht in order to suit the regulations. Her rate of success decreased from 1965 to 1980, since she remained in the coasts of Australia and was primarily used as a model for building new vessels. In 1990 she returned to Europe, settling in Italy and returning to the Mediterranean races, but without obtaining the good results he used to have on her past. In 1999 he was subjected to a significant improvement, with changes in the engine and the deck. From this current year 2014, she belongs to Patrick Howaldt, who has taken him back to his home country, the United States.